He got the idea of proposing to teach me chess, which he could play a little. I tried almost against my will, and after i had more or less learned the moves, my progress was so rapid that before the end of our first sitting I could give him the rook which at first he had given me. Every time I have tried to practise by studying games with Philidor's book or Stamma's the same thing has happened to me; I have completely worn myself out and found my play weaker than before. For the rest, whether I have given up chess for a time or kept myself in practice by playing, I have never improved a jot since that first sitting; I have always found myself just where I was when I got up from it. I might practise for thousands of centuries, and at the end I should be capable of giving Bagueret his rook, but that is all. Time well spent, do you think? In 1742 Rousseau came to Paris with the hope of making his fortune with a new scheme of musical notation and, when, that fell through, briefly fancied he could make a name for himself as a chess player. He seems to have played chiefly not at the Régence, but at the Café Maugis in the rue Saint-Séverin (remembered today only because it featured in a police report). There I made the acquaintance of M. de Légal, of M. Husson, of Philidor, and of all the great chess players of that time, without however improving my game thereby. But I had no doubt that in the end I should be better than any of them; and that, in my opinion, would a sufficient resource." The over-confident Rousseau's potential career as a chess player was cut mercifully short when he left for Venice in 1743 as secretary to the French ambassador. Man strives for superiority, even in the smallest things. Jean-Jacques Rousseau, who always beat me at chess, refused to give me a handicap to make the game more equal. "Does it upset you to lose? "he asked me. "No," I said, "but I would make a better defense, and you would enjoy the game more." "That may be, "he replied. "All the same, let's leave things as they are". An acquaintance who lost even when Rousseau conceded the rook, received a similar rebuff; Rousseau refused to increase the handicap, admitting simply "I like to win". 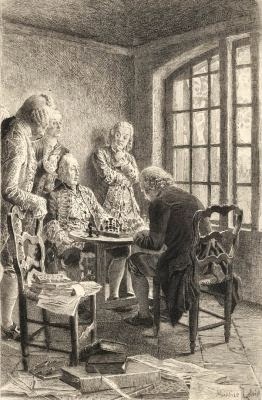 The game of chess between Rousseau and the prince de Conti. Jean-Jacques's comments to Conti have sometimes been dismissed as apocryphal but in a letter to Pierre-Alexandre Du Peyrou dated 27th September 1767 he told the same story: he beat Conti three times in a row while the prince's entourage looked on, grimacing like men possessed; he remarked to the prince that he respected him too much not to beat him all the time. Thus is Rousseau credited with courage in speaking truth to power, though the cynical might suspect a baser motive - Rousseau could not resist the chance to win! Rousseau continued to enjoy chess throughout his life. In a letter to M de Saint-Germain, dated 26th February 1770, he confirmed that he did not gamble but still liked to play chess. When he returned to Paris in 1770, Grimm noted in the Correspondance littéraire that Rousseau showed himself "several times" at the Café de la Régence, but such crowds gathered that the police warned him off from appearing in public. Nonetheless,at the Régence as at the Procope, Rousseau and Voltaire's customary tables were long remembered. According to one chess commentator in 1836, their places had until recently been indicated to waiters with the command to "serve Jean-Jacques" and "serve Voltaire". What was Rousseau like as a chess player? The jury is out on Rousseau's actual abilities as a chess player, and is likely to remain so. 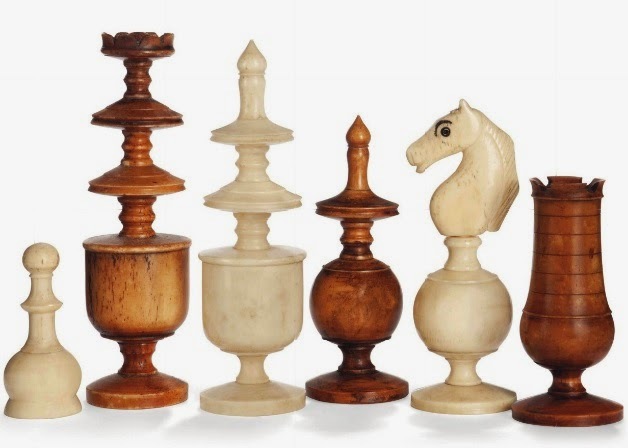 Vast amounts of ink have been spilled over accounts of the supposed game play of the match with Conti and of another game, which Rousseau lost to the abbé Jean-Joseph-Thérèse Roman at Môtiers (preserved in the abbé's splendid chess-themed poem Les Echecs of 1762). According to the chess historian H.J.M. Murray both are spurious; the first derives from a manuscript concerning the games of the Spaniard Busnardo, the second is a Greco game and a literary forgery. 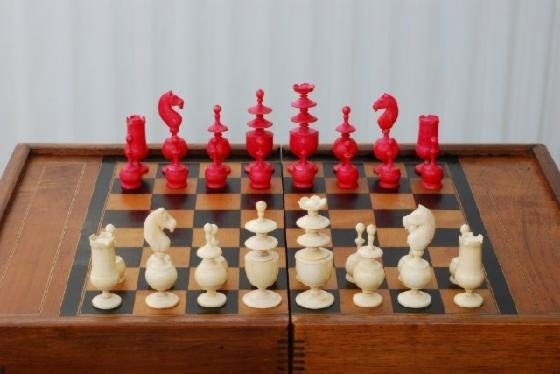 We can only fall back on Rousseau's own assessment that, although he entertained the possibility of becoming a serious player, he lacked the ability to master complex strategies in the abstract. One observer reported that Rousseau considered his moves carefully but then played quickly in a state of great excitement. This fits with his personality. We may surmise that he was a competent player but that he lacked the patience and the calculating brain of a Philidor.